My art project for February is oil paintings. I find February the most difficult month of the year. It is usually very cold, rainy and grey, and the worst of all, windy. So it turns put to be the month I spend inside most of my time, painting wise. I usually turn to watercolor work, or drawing, both of which I enjoy. But this year I am taking out the oils in February. 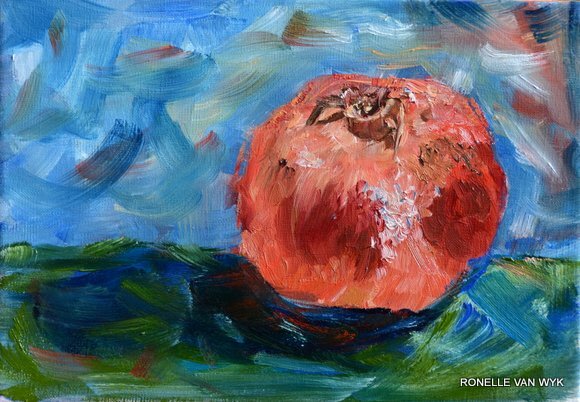 I have bought a lot of small canvases on which I intend to do small and quick stillifes, not a formal, still life set up, bit more single pieces of fruit and vegetables, objects from the kitchen and refrigerator and veggie basket. I am awful at doing still lifes, I have done only a very few oil still lifes and I can’t say I enjoyed it very much. I find still life too static for me. I have no adrenalin pumping when doing a still life…there is no changing elements like wind or changing light or heat or movement which prompt me to work loose and fast and prevent me from fiddling. Standing in front of a stillife gives me too much time to fiddle, to much time to stand back and contemplate what to do or change, too much opportunities to return to the work and “fix’ what I don’t like. 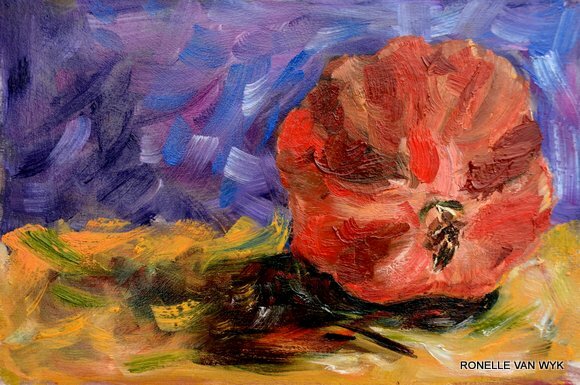 These little paintings are exercises in different strokes, using different sizes of brushes and techniques and rendition in everything BUT realism.. All of them are done in one go, painting wet-in-wet, impasto, sur le motif, in my atelier. After the third one, I actually started enjoying it. The first painting was horrific..I was so not in the mood for this project, but I didn’t want to fail, so I put 3 pomegranates up on the table, 3 canvases on the easel at the same time and painted all three at the same time. That turned out to be not too bad and I started enjoying it. 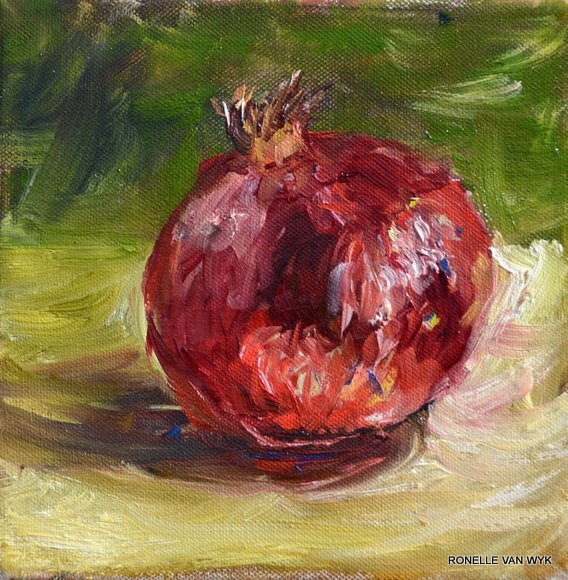 So, back to the easel where I have a fennel bulb waiting with its greens and whites and yellows…challenging! A rough sketch of some painting tools. I dug this sketch out of the bin. It ended there along with many others I’m lately not happy with. I feel in an awful slump and nothing seems to work..everything is either too “pretty”, or too perfect or it is just plain bad art. I struggle to find that exciting stroke, or that exciting subject, or even the right medium. I work on small tiny papers and do small tiny challenges. I am in need of freedom and uninhibited expression. I know what I want and what I don’t want..or do I? I wonder if art can go through menopause…in which case, that is where I would say my art is right now. Going through menopause. I hope it passes soon. …just to realize it doesn’t look better, nor worse. So. The solution is probably just to carry on and maybe consider not throwing out the awful ones. They should stay with us strive for better, or different, ot both. Yay..I’m back to plein air painting after a dry spell of two years…..The oil paintings are busy drying, while outside the thunder is rolling and the rain is showering down, bringing welcome relief to a dry garden. The days are wonderfully hot, hot, hot…I love every sweaty minute! Believe it or not, it is in this sweltering heat that I decided to move out to plein air again with my palette and oils. Summer works for me. 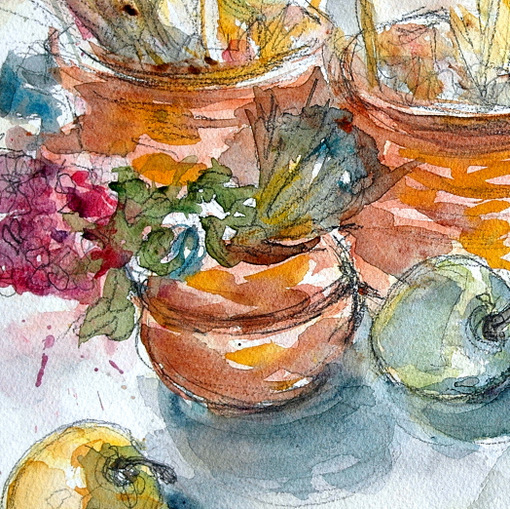 In the meantime, some peaches in watercolor, done with some big round yellow peaches and juicy flat white ones..which are all devoured by now and the cause of some tummy ache…Summer and its fruit does that to me too.. Still life with copper pots. With this second attempt at an aquarelle still life, I didn’t to set it up the still life. 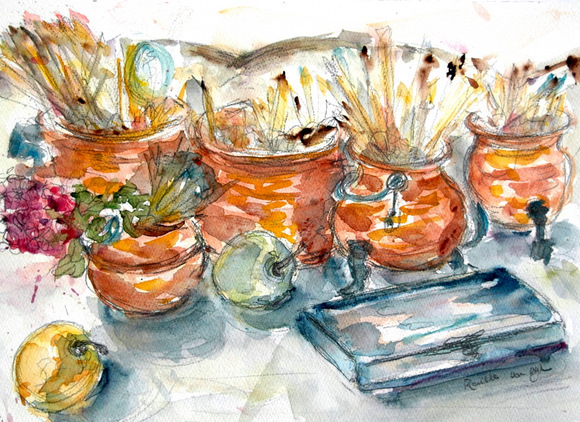 I only painted what was in front of me, which was my copper pots filled with brushes and other art stuff. I moved the objects a little to avoid “kissing” and to bring them a little closer. the apple that rolled to the side, was left as it found its place and I was very chuffed with it!It might be overcrowded for some, but I rather like the idea…in any case more than a composed and deliberate still life. Maybe it is a mirror of my life…anything BUT composed and deliberate! …and a close up of my strokes and layers. I still feel I overworked it and could’ve let go of the brush much sooner..